Tile and Grout Restoration and cleaning is not an easy job, it is not something that can be easily done using household appliances let alone, repairing and sealing tile and grout. It is always advisable to hire a tile and grout restoration professional. Here are some of the reasons why you should do the same. This surface requires cleaning on a regular basis. It could be daily, weekly or monthly maintenance Tile and Grout Restoration cleaning services. However, we think that using cleaning techniques like a toothbrush and consumer-grade cleaners would take a few hours along with a lot of labour and it would not take you any farther. That’s why you need the expert knowledge on Tile and Grout Cleaning and Professional Tile Cleaning Services. As time passes it is been seen that the seemingly smooth and shining surface of the tile becomes dirty and untidy due to day to day use and accumulation of dirt, bacteria, and oils. This, in turn, makes the condition of your floor worse within a quick span of time. These stains and dirt become difficult to be cleaned using the household appliances like mop, soap or wax. 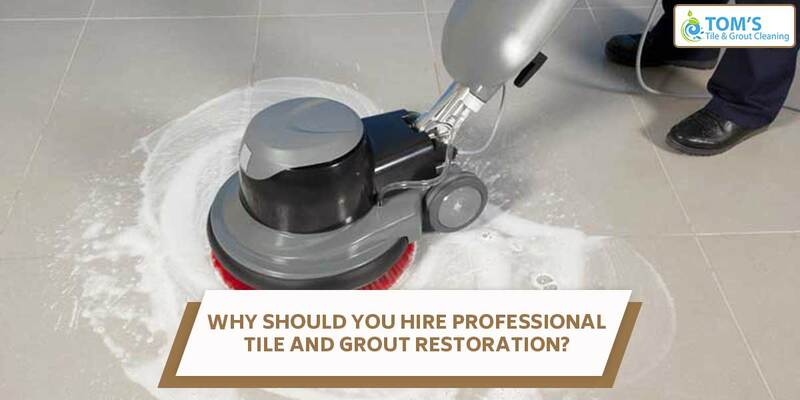 You need professional tools and materials to restore tiles and grouts. This is performed only after proper cleaning of the grout using a sealer. Professional cleaning and repairing service providers serve premium Sealer. Tile sealing helps in restoring the grout by minimizing and repelling discoloration from the grime, dirt and acid. It is to be kept in mind that harsh cleaners can destroy the sealant after some days. Saves you time and resources, as tile and grout restoration is not a small job. It takes labour. Along with that getting fixing materials and tools from stores can cost heavily on your pockets. You do not risk your health or the environment. Major cleaning service providers are eco-friendly, that does good to you and to the environment. You do not have to worry about damaging the beauty and shine of your washrooms while they are cleaned and restored as the professionals are highly experienced. First, of, our experts will perform a thorough tile and grout inspection and clean to extract contaminants that are embedded. In the next step, we bond an exclusive proprietary polymer covering to your grout. It is better to note that our bonding process is far superior to other commercial grout sealing. This is because our product transforms your grout into a new non-porous surface. To end the tile and grout restoration process, we install a protective coating that will keep your tile and grout sparkling and shining for days to come. So in conclusion here are the advantages and disadvantages mentioned in a brevity when you choose a pro tile restoration cleaner and a grout restoration cleaner. You get a long-lasting solution at a good value. So if you wish to get same-day, on-site tile and grout restoration service call Tom’s professionals at 1300 068 194. We will be happy to be at your service.